The presumption of innocence is a cornerstone of law, a principle that has been relatively uncontroversial since it was introduced by third century Roman jurist Julius Paulus Prudentissimus. Yet even in 2018, it seems that this right is still not enjoyed by all our state’s teachers and administrators. Traditionally, when a suspension decision was made by the department, it was made under the Public Service Act 2008. This act includes specific provisions relating to the department’s power to suspend, the effect of suspension, and decisions about whether employees should be suspended without pay. For many years, all suspensions were with pay. Only rarely was a teacher cut off completely. In those cases, there had usually been a criminal process and a decision made by the courts at the committal stage that the teacher was liable to be convicted of a criminal offence. That sensible and ethical approach appears to have been abandoned over the past two years, which have seen an alarming number of teachers suspended without pay. One recent case involved a teacher accused of sexual abuse of students (which he denied and was later acquitted of on the basis that the allegations were untrue). The department stopped his pay shortly after the charges had been laid. 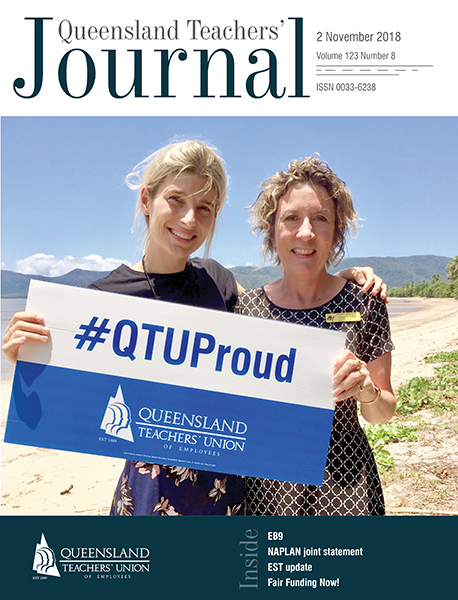 The QTU funded legal assistance for a Judicial Review of the decision, and when the matter was heard at the Supreme Court, the senior judge was outraged. In the face of this judicial incredulity, the department abandoned its defence of the indefensible and fairness was restored. Undeterred, however, government officials began to employ an alternative method. In recent months, they have been using a power under the Industrial Relations Act 2016 to again suspend teachers without pay. The IR Act power relates to stand down, which is a power that was used widely in the 2011 floods when businesses were unable to open due to flooding and had to ask their workers not to attend work for a couple of days. We are now seeing the department using this power in disciplinary matters in which the teacher involved does not even face criminal charges, and in one case where they faced only unproven allegations by a former student. Disciplinary actions can take years to be finalised by the department, and to use a stand down power for this purpose is plainly unfair. It is also inconsistent with the fact that the Public Service Act has a specific and clear set of rules, which the department is supposed to follow. Suspension is a stressful and anxious time for teachers, administrators and their families. For members to face financial destitution while the department takes many months (and often years) to finalise disciplinary matters can only be described as unfair. It will not go unchallenged.